Carmela Altamura, president, founder/director, ICPA, Inc.
From its establishment in 1988, the bi-annual Altamura/Caruso International Voice Competition abolished age limits. Aware that existing limits did not allow for the late-maturing, dramatic voice, and by careful scrutiny of more mature applicants’ achievements, the founders decided to open the door of opportunity to more mature as well as younger singers. Much consideration will be given to all applicants’ achievements within the last five years of his/her career. Please Note: The head shot should be a high resolution (300 dpi minimum) photo, preferably in jpg format. The dimensions of the photo should be at least 5″ x 7″. High resolution photos are necessary for print publications. Low resolution photos are acceptable ONLY if they have large dimensions (e.g. at least 20″x 30″). Please note: DO NOT use a photo taken from a website or taken with a cell phone and converted to 300 dpi. It will not print properly. If you are not capable of doing this yourself, please ask for technical assistance from someone who is able to help you. Please be sure that your photo jpg is labeled with your NAME and VOICE CLASSIFICATION. Applicants must include a $100 FEE (check or money order only) made payable to: Inter-Cities Performing Arts, Inc.
Be prepared to sing FIVE arias in the original key and language. One aria will be chosen by the contestant and a second aria by the jury. Aria with cabaletta must be presented in its entirety. Be prepared to sing ONE work from the Art Song literature. Applicants must be prepared to sing a full recital upon 24-hour notice. Finalists will be recorded and videotaped for YouTube. By applying to this competition, participants agree to be recorded and videotaped for YouTube and other media. Finalists must be present at the stage rehearsal, which will be announced following the preliminaries. You may bring your own pianist. If you need a pianist, please let us know in advance and one will be provided for you. 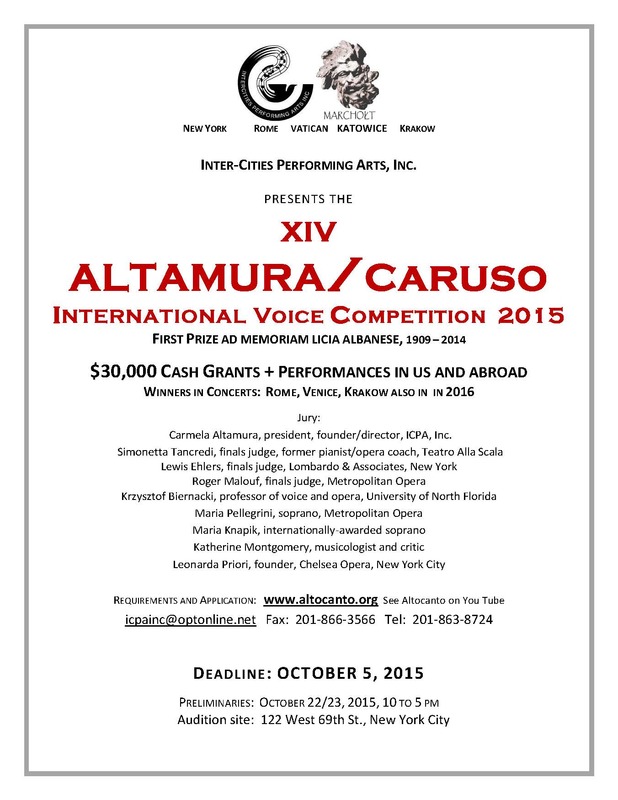 About This Competition: In 1988, two philanthropists, soprano Carmela Altamura and attorney Leonard Altamura, founded the Altamura/Caruso International Voice Competition. 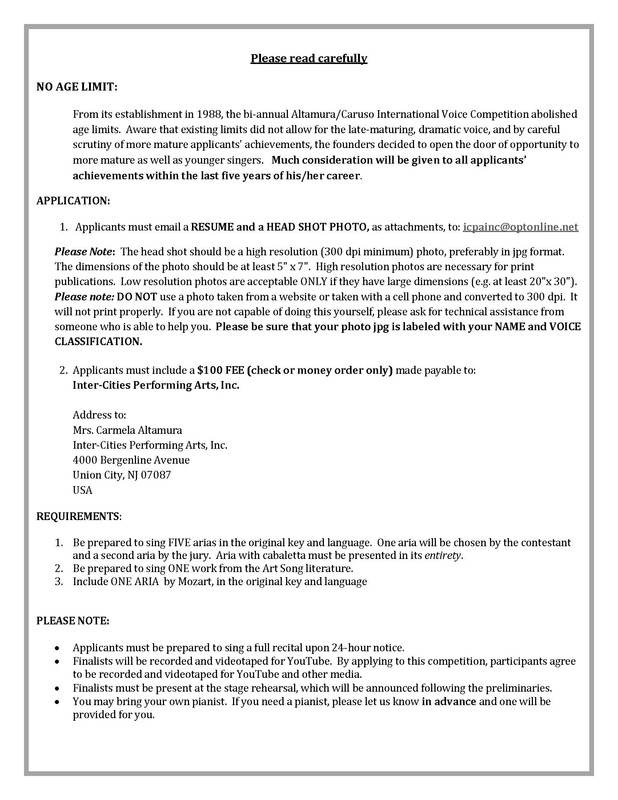 Created for singers on the threshold of an international career, the competition functions under the umbrella of its parent non-profit, Inter-Cities Performing Arts, Inc. The competition immediately established itself by instituting the then-unheard-of policy of abolishing age requirements. Aware that existing limits did not allow for the late-maturing, dramatic voice, and by careful scrutiny of more mature applicants’ achievements, the founders decided to trust their instincts by opening the door of opportunity to more mature as well as to younger singers. This policy paid off in unexpected dividends. Competition winners Angela Brown, soprano, Audrey Stottler, soprano, and Kim Josephson, baritone, went on to sing title roles at the Metropolitan Opera, La Scala, and New York City Opera, while Heather Myers, contralto, Eugenie Grunewald, mezzo soprano, Anna Shafajinskaya, soprano, and Lawrence Harris, baritone, performed title roles at the Vienna Staatsoper, Berlin State Opera, Lyric Opera of Chicago, Houston Grand Opera, San Francisco Opera, and other major opera houses of the world. Another competition innovation included behind-screen auditions, following the age- and colorblind policies of major world orchestras. Regarded as a radical new step at the time, this practice was soon adopted by other prestigious voice competitions throughout the world. 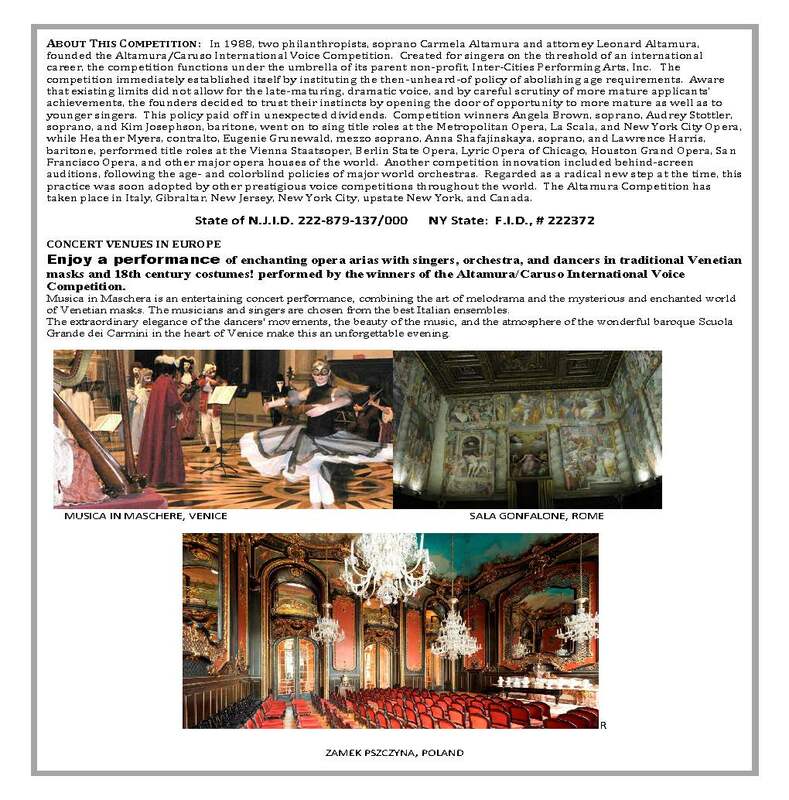 The Altamura Competition has taken place in Italy, Gibraltar, New Jersey, New York City, upstate New York, and Canada. Enjoy a performance of enchanting opera arias with singers, orchestra, and dancers in traditional Venetian masks and 18th century costumes! performed by the winners of the Altamura/Caruso International Voice Competition. Musica in Maschera is an entertaining concert performance, combining the art of melodrama and the mysterious and enchanted world of Venetian masks. The musicians and singers are chosen from the best Italian ensembles. The extraordinary elegance of the dancers’ movements, the beauty of the music, and the atmosphere of the wonderful baroque Scuola Grande dei Carmini in the heart of Venice make this an unforgettable evening.